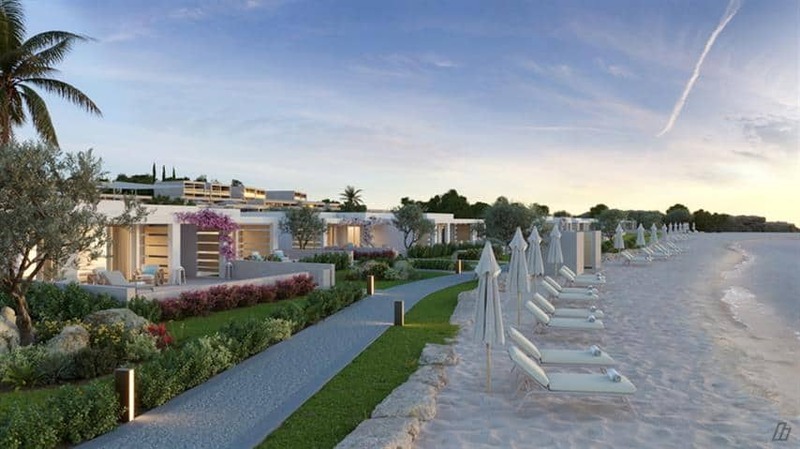 Design Holidays are delighted to announce the latest Ikos resort to our portfolio , the wonderful Ikos Aria set in a wonderfully serene setting stretching over 47 acres and fringed by the fabulous coastline of the dazzling island of Kos. Kos is one of the larger islands in the Dodecanese, a little to the north of Rhodes. Within Kefalos, along the southwest coast of Kos, is a thrilling experience better felt than read about. 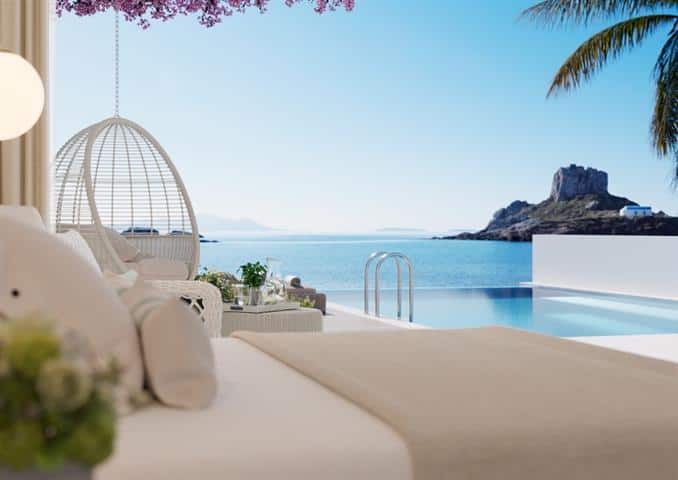 Ikos Aria Resort, Kefalos, Kos, overlooking the amazing Aegean Sea, holds the key to some of the most luxurious hospitality the Dodecanese in Greece have to offer. Kos, also know as Cos, is and Island in the South Aegean Sea. 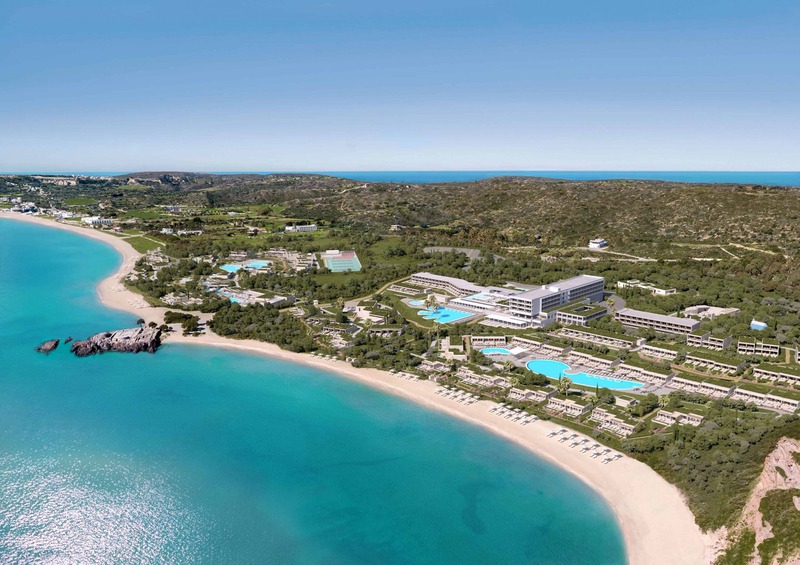 The latest addition to the Ikos Resorts, the Aria, Kos, is an all-inclusive holiday which not only offers you an exquisite Ikos-styled vacation trip experience but also gives you the chance to explore the triple-packed magic of Kefalos, Kos, and the Aegean Sea. 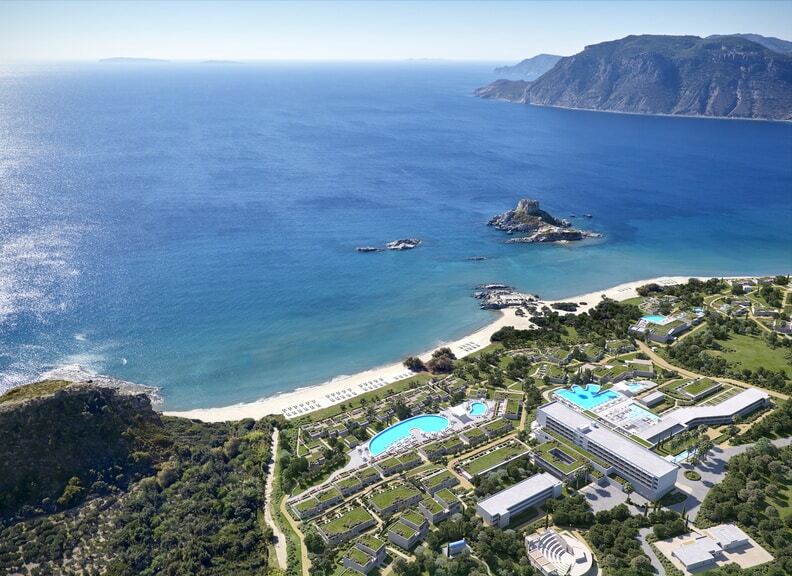 The Ikos Aria resort stretches 47 acres and harbours unique pleasures, such as the golden Kefalos sand beach, amazing a la carte restaurants with Michelin-stars, brilliant accommodation suites, relaxing sporting activities, and entertainment programs for the entire family. These make for a thrilling Dodecanese 5-star holiday treat you will not forget in a lifetime. Enjoy your annual leave and holiday in luxury. WHY STAY AT IKOS RESORTS? 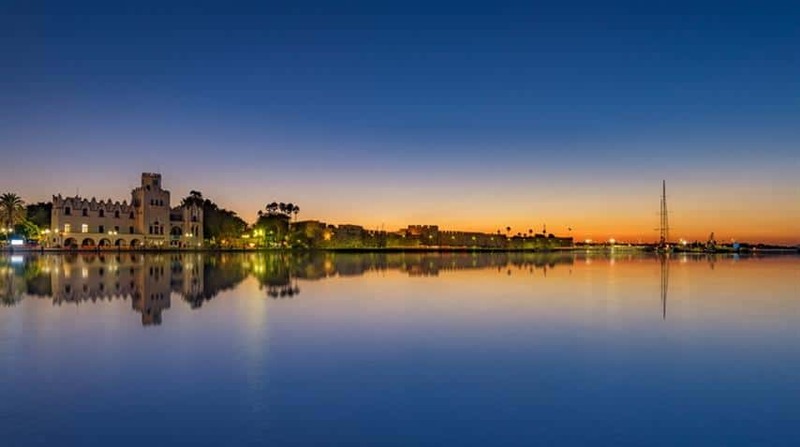 Ikos Aria offers a luxury holiday on the magical island of Kos on an All Inclusive Basis with everything for families and couples alike, either for those looking for pure relaxation or for a more active holiday. No more hefty drinks bills on check out as all drinks and food are included in the cost of your holiday as are all sports (except for the odd watersport, motorised etc). There are 370 luxuriously appointed rooms & suites offering either spacious gardens, ocean views, private gardens & pools or all of the above. Double rooms – Generous size 23msq based in the main building at Ikos Dassia with Dassia with panoramic window views of the garden or ocean with private balconies. Superior Double / Triple Rooms – Generous size 25msq based in the main building at Ikos Dassia with panoramic window views of the garden or ocean with private balconies. Junior Suites – Perfect for families with 2 adults / 1 child with 35msq at Ikos Dassia with panoramic window views of the garden or ocean with private balconies. Panorama Junior Suite – Sea Facing family suites of 35sqm perfect for a family of 2 adults / 2 children with balcony and private garden. I bedroom Bungalow Suite – Perfect for a family of up to 2 adults and 3 children these 1 bedroom suites with separate lounge and large balconies combine 50sqm of space and offers a choice of garden or spectacular ocean views. Family Room – Located in the main building these fabulously spacious 50sqm family rooms sleep up to 4 persons with panoramic windows and balconies and a choice of garden or ocean views. Deluxe Junior Suite – Perfect for a family of 2 adults and 1 child with 40sqm combining a bedroom and living area with private balcony and stunning garden views. Guests can also enjoy The Deluxe Collection pool and beach access. Design Holidays Guests can also have a Deluxe Junior Suite with private pool. Deluxe 1 bedroom Bungalow Suite – Perfect for a family of up to 2 adults and 3 children these 1 bedroom suites with separate lounge and large balconies combine 50sqm of space and offers a choice of garden or spectacular ocean views. Guests can also enjoy The Deluxe Collection pool and beach access. Deluxe 1 bedroom Bungalow Suite with private pool and beachfront – Perfect for a family of up to 2 adults and 3 children these 1 bedroom suites with separate lounge and large balconies combine 50sqm of space with a stunning private pool with beach setting and spectacular ocean views. Guests can also enjoy The Deluxe Collection pool and beach access. Deluxe 2 bedroom Bungalow Suite – sleeping up to 6 persons (ideally for a family of 2 adults / 4 children) these stunning 2 bedroom 85sqm bungalow suites offer 2 bedrooms (both with en suite) and lounge with terrace. Guests can also enjoy The Deluxe Collection pool and beach access. Deluxe 2 bedroom Bungalow Suite with private pool – sleeping up to 6 persons (ideally for a family of 2 adults / 4 children) these stunning 2 bedroom 90qm bungalow suites offer 2 bedrooms (both with en suite) and lounge with private pool and terrace. Guests can also enjoy The Deluxe Collection pool and beach access. Deluxe 2 bedroom Bungalow Suite Beachfront with private pool – sleeping up to 7 persons (ideally for a family of 2 adults / 5 children) these stunning 2 bedroom 120qm bungalow suites offer 2 bedrooms (both with en suite) and lounge with private pool and terrace. Guests can also enjoy The Deluxe Collection pool and beach access. *Each room / suite / villa includes mini bar consumption on all inclusive basis , with all rooms being re stocked daily. Ikos Aria offers all ages of children from 4 months to 17 years a full programme. From Crèche to Mini Club toTeen Club. There’s organised programmes of sports, activities and fun learning indoors and out – all carefully overseen by the renowned UK-based childcare company Worldwide Kids with its fully qualified and experienced staff. 3pm – 6pm (afternoon session). Enjoy 1 buffet & 7 of the most magnificent a la carte restaurants brought to you by Michelin star chefs , all offering fabulous cuisine from the best of Greece and world over brought to you in true Ikos style. Kos– Mediterannean style buffet for breakfast, lunch & dinner. Ouzo – Greek a la carte fine dining open breakfast , lunch and dinner in a marvellous beach setting. Fresco – Italian a l carte fine dining open for evening dinner only. Anaya – Asian fusion a l carte fine dining open for evening dinner only. Provence – French a la carte fine dining open breakfast , lunch and dinner. El Vasco – Basque a la carte overlooking the main pool offering fine dining open breakfast , lunch and dinner. Ergon – Greek a la carte fine dining open breakfast , lunch and dinner. Flavors – Mediterannean style buffet for breakfast, lunch & dinner in a most magical beachfront setting. 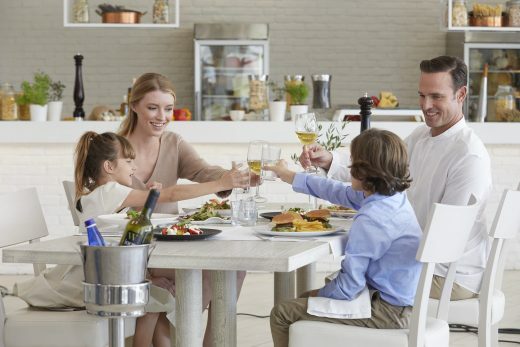 Dine Out – As with all Ikos Resorts , Ikos Dassia are mindful that as an All Inclusive resort they wish to invest in the local economy, therefore all Design Holidays guests are invited to dine on an All Inclusive basis at a local Taverna included in the price of their Ikos Dassia holiday. *Ikos restaurants and their sommeliers offer a wide selection of over 300 local and international wines. The below sports are included at Ikos Aria. *Please note the below sports are payable with a surcharge locally. The Ikos Spa has a team of therapists offering a multitude of therapies and treatments. Complete with a heated indoor pool, Jacuzzi, hammam , sauna , fitness studio, hairdressing and nail salon. Anne Semonin therapists and products typify the magnificent Ikos Aria Spa experience. Enjoy the live musical entertainment available in the bars at Ikos Aria from local Greek music to funky DJ sets, take your pick. The Ikos entertainment team put on a nightly show from west end musicals to broadway classics, there are even cinema nights. 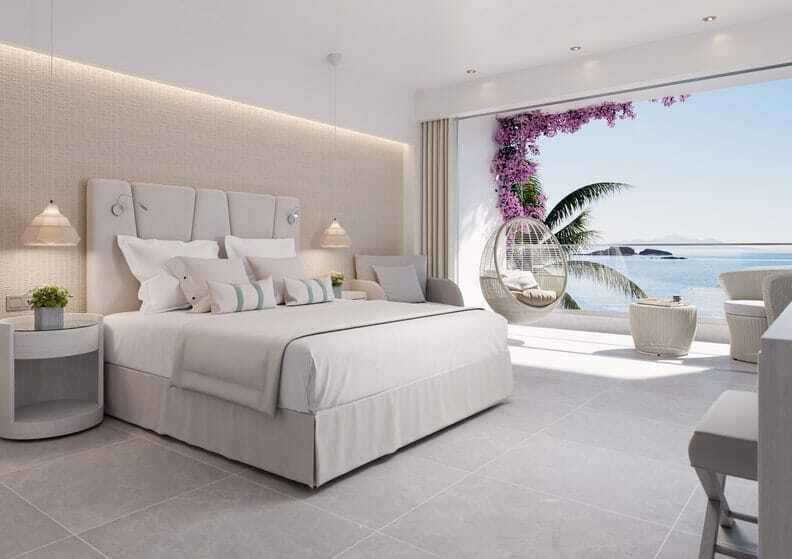 At Ikos Aria in Kefalos , there are more than 370 stunning rooms and brilliant suites offering a choice of an amazing Aegean Sea view, private balconies, individual pools and beautiful gardens. These come with added features that will provide maximum comfort and make your stay truly relaxing. The Ikos Aria resort has eight charming a la carte restaurants offering some of the best Greek culinary treats in Kos and a touch from other cultures. The dine-out programme also provides an opportunity to check out local restaurants in Kos and appreciate Kos/Greek food offerings. 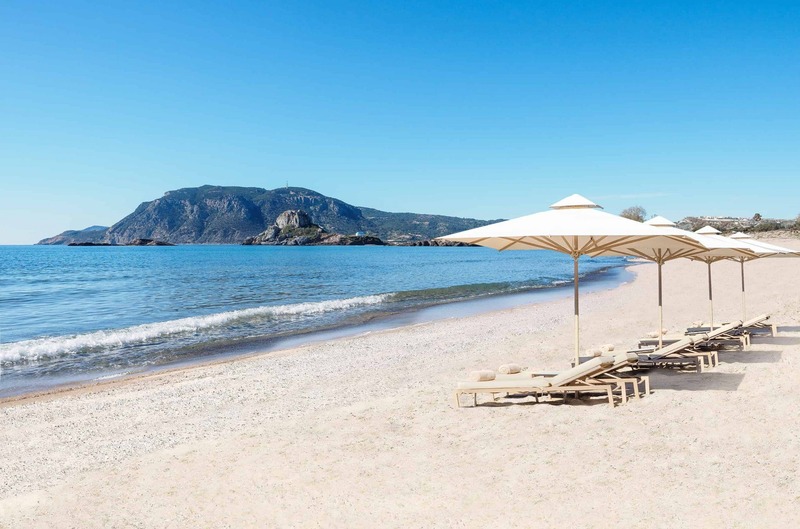 As a guest at the Ikos Aria resort in Kefalos, you can choose to explore the golden Kefalos sand beach at will or relax in any of the heated pools and unwind. The beach and pool team are always on hand to provide anything you may need, and even keep the kids busy for awhile to help you truly relax. What better way to end an exciting day after a tour of Kefalos and Kos than with appealing entertainment set up especially for you? You can choose to dance all night in a club/beach party or you can elect to relax in a laid-back bar and unwind. If you are a lover of live music and theatre, you can also choose to enjoy our carefully set-up live shows. Whichever you desire, and on any evening during your stay in Kos, Ikos Aria got you covered. 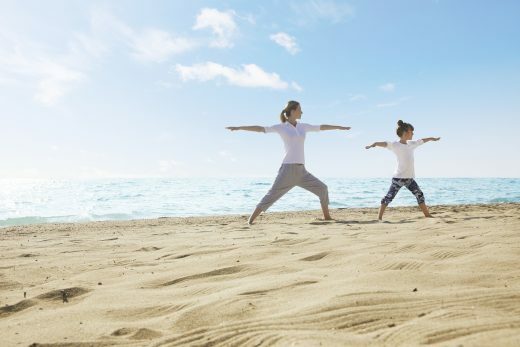 Carefully overseen by the UK-based consultancy, Worldwide Kids, the Ikos Aria resort in Kefalos has lots of organised programmes and activities for the kids. The Crèche, Mini Club, and Teen Club for the young ones, of ages four months to seventeen years, ensure they get their own share of fun and entertainment, while giving you and your partner the chance to relax and enjoy your stay in Kos. As a Design Holidays guest, you can experience the thrill of the Ikos Aria at a better price – thanks to our buying power – than you would if you booked the resort yourself. 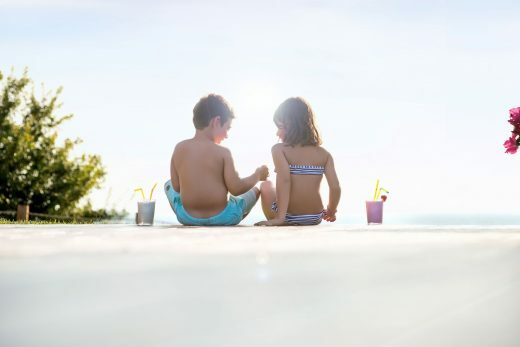 For 25 years now, we have been widely regarded as one of the UK’s leading family holiday companies with packages across diverse resorts in Europe. Request a quote or call us now on +44 (0) 1444 87 2200 for more information, and to take the first step towards an all-inclusive Ikos Aria holiday thrill in Kefalos, Kos. Ikos Aria is located on the southwest coast of the island of Kos in Greece, a short 20 minutes drive from the airport and 45 minutes from the lively town of Kos. The island of Kos is steeped in history and Ikos Aria is an ideal base from which to explore Kos’s archaeological wealth, as well as the surrounding island.